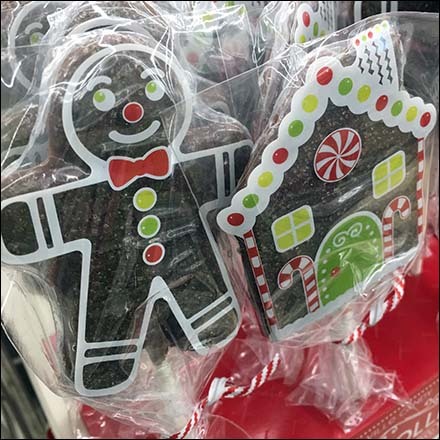 Nothing is more appropriate for the Season than this Christmas Gingerbread Holiday Lollipop Display. Both Gingerbread Man and Gingerbread House are on offer. But the display does not promise Gingerbread Flavor, s possibly a more traditional candy taste. In any case Melville Candy provides a shelf edge point-of-purchase presentation that pleases. This Christmas Gingerbread Holiday Lollipop Display seen at Michaels.